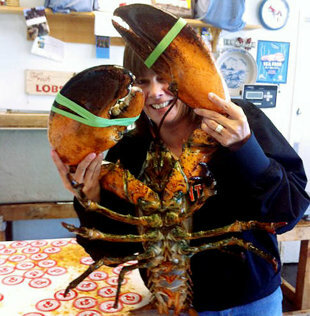 Check out the size of that lobster, holy cow, er lobster. Seventy-five years of life in the wide open sea only to be caught in a trap to become someone's dinner. Good on ya, Jennifer for finding him/her a home! I'm so glad Mr. Big Lobster found a home. Since I was a kid, I've had this urge to free the lobsters in tanks because I thought they were cute in their own lobstery way. In fact, before first grade we were in the grocery store, and some kid did take the lobsters out of the tank, and they were roaming the aisles. It was really kinda cool. On the other hand, lobster is downright tasty. Although, these days given the ocean pollution I don't think I'd eat one, even if I had the chance. Serena, they did look peaceful. I liked watching them too. Of course, then I would start feeling bad that they were going to be someone's dinner... life is really weird!!! Holy Moly. That's one ginormus lobster! !